Firstly one photo? Yes… one photo. When we took this photo it was just before it chucked down with rain and it was also freezing… I don’t believe my face does justice to how cold it was! On the other side I’ve also been really struggling with blog photos of late. As we continue on our gym journey I’m really feeling and seeing a discrepancy between my body and how i feel inside, thats most likely a post for another day, but it does explain the lack of photos on this post. 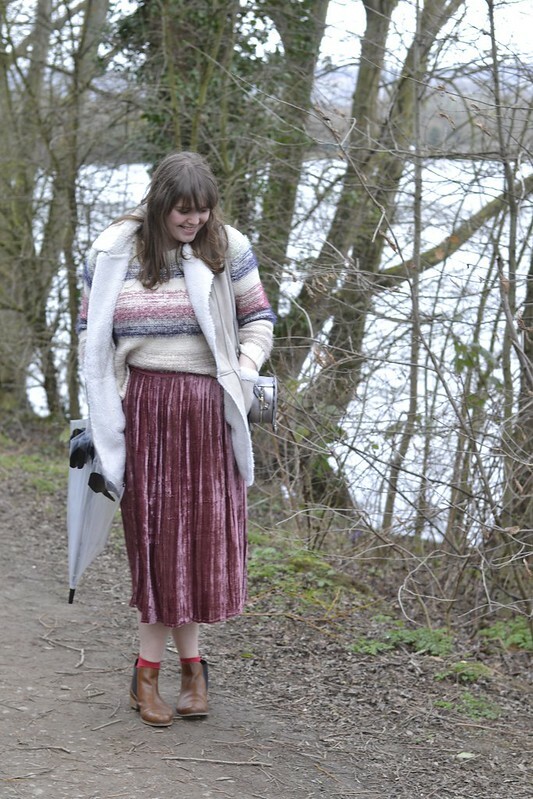 I have been in love with midi skirts for a while now and while I have a gingham one for the summer months, when I saw this pink velvet number on sale in Anthropologie I knew it would be a worthwhile wardrobe investment for evening wear and the colder, winter months. Although I wouldn’t say it photographs perfectly, in real life it is quite lovely! (Also I probably wouldn’t suggest the crazy thick jumper I’m pairing with it either – unless like me you were freezing, even under sherling!) For a night out a pair it with a thinner black top and blazer, this would streamline the look or for something more relaxed a simple white t shirt can never be forgotten! If I remember correctly I also got this on uber sale, reduced from £98.00 to only £29.99… bargain or what? You are absolutely gorgeous and that skirt looks amazing on you!!! Love your blog!